When Giovanni Porras and Hugo Ciro founded Fruandes in 2001 they had a clear vision: to support the small-scale farmers who were impacted by the downturn in coffee prices and to provide formal employment to the single mothers of Cazuca, a marginalized community near Bogotá, Colombia. "Fruandes has always wanted to highlight the enormous amount of work that so many women do every day anonymously, whether it be in agriculture, plant labour, or development,¨ said Giovanni. “When we founded the company, the idea was to offer dignified work, which provides personal development to female community leaders," he said. Many of the women who were originally employed by Fruandes had been victims of the violence of the guerrilla wars and fled their homes in the Colombian countryside in search for a better life. But this search often comes with more obstacles. Colombian women are on average more educated than their male counterparts, but still face barriers accessing the labour market. When they do, they are subject to significant salary differences and often only receive informal employment. For those who don't have much formal education conditions are significantly worse, especially when they have to try to juggle child care, supporting a family on their own and work. "Before working at Fruandes I was always either unemployed or just working in restaurants, and I never had benefits or labour rights," said Paola Sastoque, 35, plant worker at Fruandes. Her new job, she said, gave her independence after her partner denied paternity of their second daughter and left her alone to care for a newborn and a four-year-old. "I come from a humble background and the most important thing Fruandes has done for me is to show me that I can make it on my own with my daughters and that I never depended on my partner," said Paola. Fruandes´ goal is to provide opportunity and sustainable growth and to help employees and farmers grow. Seventy per cent of employees are female, and 22% of leadership positions are held by women. "At Fruandes, the machista doesn't exist. Above all we are human and we complement each other; we are like a family. We don't look if someone is better than the other, if the boss is worth more than the operator; we just work together", he said. The majority of members in small-scale farmer associations Fruandes works with are still male, but the numbers are changing. Twenty per cent of the members are female and in reality the numbers of women working in the field are a lot higher. 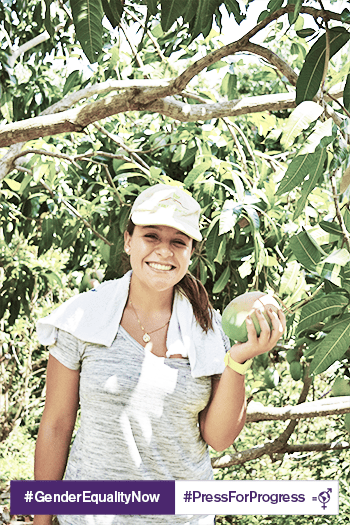 Vivián Rubio, 23, is the daughter of Omar Rubio, a small-scale organic mango farmer with Fruandes. She studies agricultural engineering and plans to one day take over the family's farm. "There are a lot of women in agriculture, but generally they stay in the background, taking care of the household and the kids, doing laundry, things like that", Rubio said, noting that farming in Colombia is still a man's world. "Especially when you're young, making yourself heard is a challenge, but not impossible." "It will take some time to change, but there are more and more women in leadership roles,”she said. ¨My dad has always taught me that it doesn't matter that I'm a woman and that I could do whatever I want with my life as long as I was respectful and considerate of other people. When people feel respected they will listen to you and help you." Neidhy López, 41, Industrial Engineer at the Fruandes plant, says that while she is grateful for the support she received in Fruandes, opportunities are created, not just received. "Fruandes was a great help for me in advancing my career and I´m very grateful for that", said López, who did her internship and thesis with the company. "Gender equality depends on all of us", she said. "Of course we want to get somewhere as women, but we are also responsible for what we do. If we search opportunities, we will find them. If we stay in a place where we are treated badly, we take on the role of the victim. If I stay where I'm not happy, that's on me."